Get involved in free, creative workshops, which take inspiration from Ugo Rondinone's colourful outdoor sculpture, Liverpool Mountain. Play with different materials to create your own balancing structures. 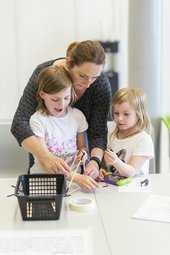 This workshop is led by artist Fiona Smith and is suitable for all ages.